a track on R.E.M.’s upcoming new album Collapse Into Now, which is due from Warner Bros. Records on March 8th. R.E.M., which is singer Michael Stipe, guitarist Peter Buck, and bassist Mike Mills, and Collapse Into Now’s producer, Grammy-Award winner Jacknife Lee, are offering fans the opportunity to remix the entirety of “It Happened Today” from the ground up by distributing the raw source for the song as both a Garageband file for Apple Macintosh computers, or as raw stem audio files for other platforms. Lee, himself, has prepared both sets of files, which delivers the song in its "raw" state with no reverb, mixing, or effects. Users who visit the band’s website, www.remhq.com, can download all 16 tracks Lee used to create the song, including vocals by Michael Stipe and Mike Mills, as well as those by special guests Pearl Jam’s Eddie Vedder and The Hidden Cameras’ Joel Gibb, plus Peter Buck’s guitar and mandolin, Mills’ signature bass, and brass ensemble tracks from Bonerama. 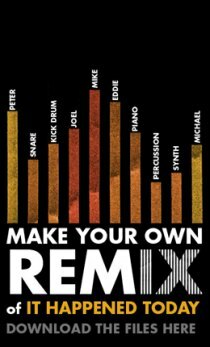 After creating their own versions of the song, fans are invited to submit their remixes on the band’s website to share with the members of R.E.M. and other fans around the world. “It Happened Today” is currently available on iTunes as an “Instant Download” track for those who pre-order Collapse Into Now. The first U.S. single from the album, “Mine Smell Like Honey,” is currently available for purchase from all digital retailers. Visit R.E.M.’s YouTube channel for lyric videos for several tracks on Collapse Into Now at http://www.youtube.com/user/remhq.